Baby Rhino Sibeva at Baby Rhino Rescue | Adopt and Donate Now! A search team went out, but all spoors were washed away in the heavy rain. To make things worse, the calf ran into thick bush and vanished! A search and rescue team was deployed; however due to heavy rain the spoor (tracks) of the rhino calf was washed away. The small calf had also run to a section of the reserve where there was extremely thick bush that hindered the ability of the pilots who were scouting from the air. Nevertheless, extra trackers were called in from a neighboring farm to help in the search. 8 days passed and all hope faded. Incredibly, rangers in a helicopter spotted her. She was found and brought to Care for Wild. She was angry and very wild, and it took a long time for her to relax and realize she was finally in a safe place. She was placed in a boma alongside some of the bigger rhinos, and she immediately bonded through the fence with a beautiful, big adult, referred to simply as B10. 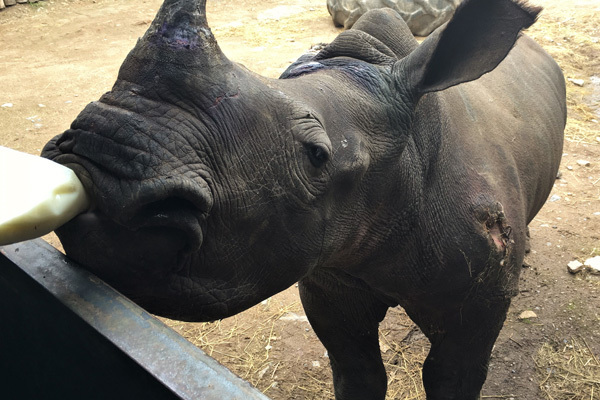 When Sibeva was introduced to B10, B10 rubbed herself on Sibeva, declaring: “You are mine!” Sibeva now fully recovered, is one happy rhino. She has grass, she has play time all day in the fields, and she once again has a mother. This is a great rehabilitation story.